It’s been a long time since my last post on this site. Time to update it a bit. Recently, some colleagues of mine and I were looking for a digital multimeter that could be used by people with low or no vision. We found a pretty good low-cost Bluetooth-connected meter from General Tools, model TS-04 (credit to Pedro G.C. Oliveira for finding it). It connects to an app for iOS or Android that’s reasonably accessible with a screen reader, but I thought it’d be helpful if it were possible to build customized interfaces for it, to match the user’s abilities and preferences more closely. What follows is an explanation of the process. The final code to make it possible can be found on my GitHub account. 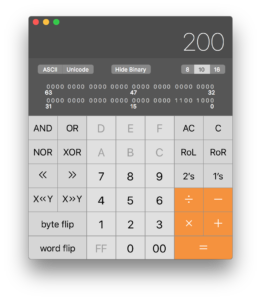 Apple calculator in engineering mode (press command-3 to enter this mode). 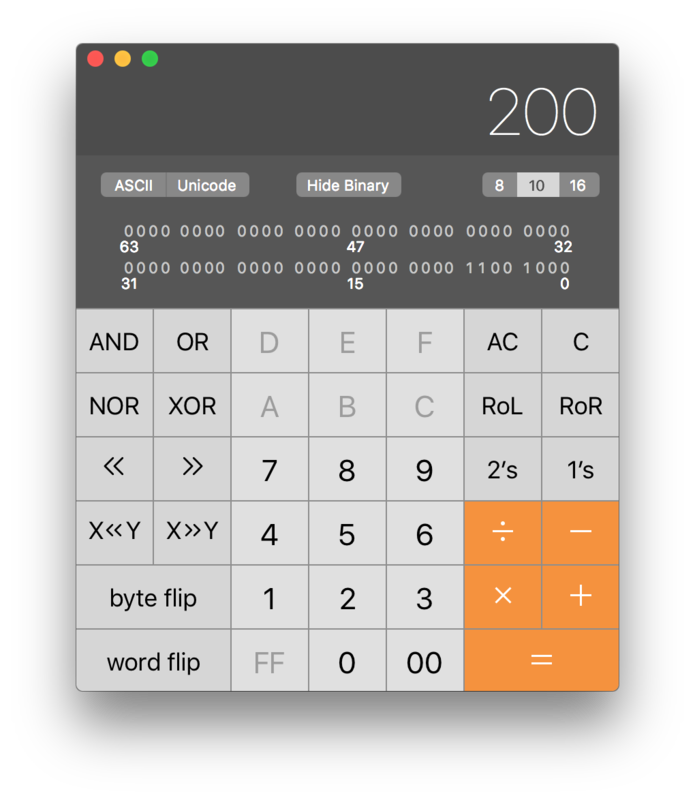 In this mode, you can view numeric results in decimal, hexadecimal, or octal modes, you can see the binary values of each number, and you can perform bitwise operations like AND and OR on numbers. 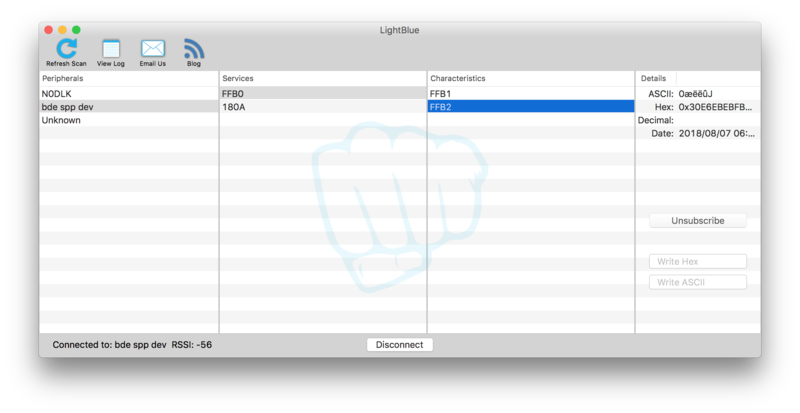 Punchthrough’s LightBlue app is a good tool for browsing Bluetooth LE peripherals. You can view a device’s services and characteristics, and read from and write to them. LightBlue is useful for learning the UUIDs of Bluetooth LE peripheral devices and their services and characteristics. Once I knew those, I could connect to it using a Bluetooth LE programming environment. I chose to use Web Bluetooth (details available here) to make it easy to build an interface in HTML that could be used in a browser. Yining Shi’s example for p5.js was useful (on gitHub), as was Uri Shaked’s post on Medium (at this link). My connection code is on my gitHub repository at this link. It’s worth noting that web Bluetooth may not be the best solution to this problem. As of this writing, it only works in Chrome, and the device discovery chooser is not accessible to some screen readers, from what I can see. I don’t believe a solution is forthcoming to that problem until it’s available in other browsers. But hopefully it will change if web Bluetooth catches on in other contexts. 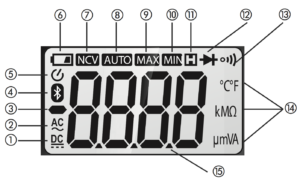 To figure out how the meter worked, I looked at the display and went through all the settings to understand what each one looked like. units: '', // what you are measuring: V, A, ?, etc. magnitude: '', // kilo-, milli-, mega-, micro- ,etc. That gave me a data structure I could fill in that could be used for any interface I want to build. The other bit checks are similar. The full program is in the ble-ts04.js file. 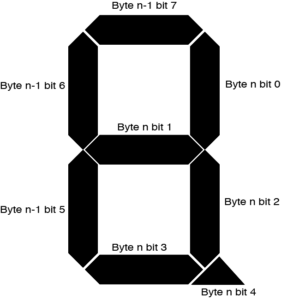 The segments of a seven-segment LCD shown, labeled with the bit that controls each segment. 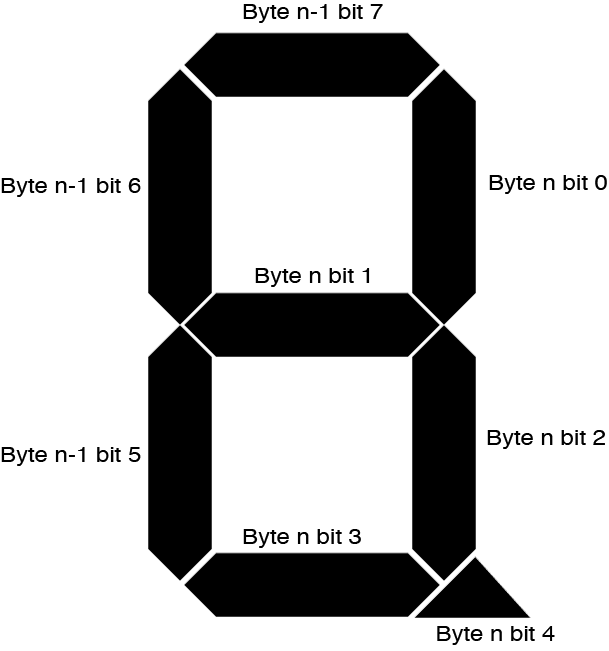 // with the lower four bits of the second byte. There are still some missing pieces. I didn’t try to find the battery, Bluetooth, or Auto-off icon bits, because they’re not useful in general operation. I couldn’t get data on the continuity beep, other than to look for 000.0 when in continuity mode. I didn’t try to remotely modify the display. This last may be possible since the characteristics are theoretically writeable without response. I built a minimal HTML interface for the meter, just enough to show the pieces needed. A more fully-realized interface for different abilities would be a good idea. Mine is below. The elements should be self-evident. View the HTML here, or see the live preview here. // Is the meter connected or not? // is the hold button on? // what setting are you on? The full project can be found on my gitHub repository. Enjoy, I hope it’s useful to someone. Thanks to John Schimmel, Pedro G. C. Oliveira, Claire Kearney-Volpe, and Josh Miele and the Blind Arduino Blog for inspiration. Recently, Federico Fissore added node.js to the package repository for the Arduino Yún. Here’s how you get node to communicate with the Arduino processor on the Yún via the Bridge library. To do this, you’ll need an Arduino Yún, a microSD card, a microUSB cable and a wifi connection. You should be familiar with the basics of the Arduino Yún and node.js in order to get the most out of this post. All of the code for this post can be found on my GitHub repository. Recently, a colleague of mine was working on a project with an Arduino Yún that involved reading a lot of sensor data using the Yún’s Arduino processor and writing it to the microSD card via the board’s Linux processor to be served to other devices via HTTP. She found that it took anywhere from 20 milliseconds to several seconds to get the data from the sensors written to the SD card. “Why is it not real-time?” she asked me. Welcome to the world of embedded operating systems. They are not realtime. “Realtime” can mean many things. In automotive systems, for example, your car’s braking system had better react in “realtime” or you’re dead. That might mean only a couple of milliseconds. When measuring high-speed rotation, it might even mean microseconds. At the electrical level, all computers are made up of transistors, so in computing, the fastest version of “realtime” means “how fast can you read and act on a changing voltage on a transistor?” Some of the input/output pins of a microcontroller are usually hardware interrupt pins, meaning that they can be programmed such that if there’s a change on that pin, the program running on the controller is immediately interrupted and a special function is run. This function, called an interrupt service routine or ISR, is typically very short. Normally an ISR simply stores the result of the interrupt in a variable. Then the processor returns to the main program. Operating systems, both on small boards like this and on servers and personal computers, do not guarantee a minimum response time to physical I/O. They are written to optimize processor sharing between programs, so the scheduler, a core part of the operating system, doles out processor time to each program. Even before the programs you run get time, there are OS tasks that take time. Disk writing is one of the most time-intensive tasks. Perhaps the only longer task is a network transaction, because the data is going through many computers, each with its own operating system. 2) a “realtime operating system” or RTOS. RTOSes are stripped-down operating systems that leave many core functions out. As of yet, all RTOSes are custom packages, not very user friendly, though there has been some work lately on realtime linux. I haven’t seen one running on any of the hobbyist boards, but i wouldn’t be surprised if we don’t see one in the next year or so. When we designed the Yun, we decided we’d give users the benefits of both real-time and an operating system. What you do on the 32U4 (the Arduino processor) is real-time because there is no operating system. What you do on the linino side is not, because it’s running linux, an operating system. The typical approach to a networked project (whether a Yun or other system) is to do all the real-time operations on a non-OS micro controller, then send the results to an operating system computer in non-real-time, after the action has happened. Let’s say you’re using a rotary encoder to measure the speed of a wheel on a remote control vehicle. You want to display the speed on a dashboard screen that’s networked to the vehicle over Wifi. Rotary encoders measure rotation by counting pulses generated by a rotating shaft. When the rotation is fast, the pulses happen VERY fast, and you need real-time to catch them. On a micro controller, this is typically sensed using hardware interrupts. These are sub-circuits of the micro controller that can interrupt the program flow when a change happens on a given I/O pin. They force the program to jump to a function to handle the interrupt. You usually want that function to be very short — typically all it does it to increment or decrement a variable counting the changes. The Arduino Uno has two hardware interrupts, and Paul Stoffregen’s encoder library allows you to use them for reading encoders. The way you’d build this app is to have the rotary encoder attached to the hardware interrupts of a micro controller. This controller is your physical I/O controller. You’d write a program for the micro controller that calculates the speed based on the pulse rate and sends that serially to another controller connected to a display. One function counts the pulses. That’d be done by the function called by the interrupt (these are called Interrupt service routines, or ISRs). Another function calculates a running speed based on the changing count. A third function might control the movement of the vehicle’s steering based on the value. A fourth function sends the calculated value over a serial connection to the display computer. The serial connection of the physical controller be connected to a networked modem like the Wifi shield or a Bluetooth radio, but that modem is just another single-function controller. That transmission takes time, and you don’t want to take processor time away from counting the pulses, so your physical I/O controller doesn’t handle this transmission, it only counts pulses and sends the value on. The radio controller handles the network connection. It transmits the data on to a display computer or a server. That server is typically running an operating system, and not working in real time, but that’s okay, because humans aren’t going to react in more than a half-second or so most of the time. What you see onscreen is typically a report of the sensor readings, but it’s an average or aggregated reading, not the raw, realtime reading. The delay depends on the transmission time of the data. Perhaps you have a virtual steering wheel onscreen that then directs the card, but this is not real-time either. The user gets to steer the car, but what she’s really doing is affecting the gross movement of the steering, not the fine control over the axle. She’s changing the overall balance, but the physical I/o controller is the only part acting in real-time to the sensors. It is possible for a controller that’s running an operating system to have hardware interrupts, and for it to have interrupt service routines. But those are typically part of the operating system kernel, not part of the user programs. You have to write custom kernel routines and restart the OS in order to use them. So unless you’re a kernel programmer, you typically won’t use these on BeagleBone, Raspberry Pi, or Arduino Yun. This is why there are many projects that combine the Pi or the Bone with an Arduino or other non-OS controller to do real-time sensing, and it’s why the Yun has a separate processor for that as well. A typical personal computer is made up of several controllers, in fact. There’s normally a CPU, a network controller, a controller inside any disk drive (if it’s a drive with a motor), a graphics processor, a hardware bus controller, and more. These are usually tied together with synchronous serial communication like SPI or I2C or some other means of communication. The dedicated controllers handle their subsystems in realtime, and report back to the CPU, which reports in user time (not real time). I know how to send data from Arduino to (Processing, OpenFrameworks, etc). But how to I send data from (Processing, OpenFrameworks, etc) to Arduino? And Arduino can read it and convert the numeric characters back into numeric values. So the next time you’re trying to figure out how to read data in Arduino, first decide what your data looks like, then get to know the Stream functions. In addition to find() and parseInt(), there’s also readBytes(), readBytesUntil(), parseInt(), parsefloat(), and a few other goodies. The really nice thing about these functions is that they work on any library based on Stream. So, for example, you can also use them on the Ethernet and WiFi and GSM Client and Server classes. This makes parsing network data much simpler. Let’s say you’re a fan of one of the bands in The Deli magazine’s new bands poll. There are so many good bands there, like Teen Girl Scientist Monthly, and others. And let’s say you were looking for a project for an Arduino WiFi shield or Ethernet shield. Why not make your Arduino vote for your favorite band? It’s not hard to do. And give it a go! Remember, no cheating. You can only vote once per IP address. But if you know a friend with several WiFi shields or Ethernet shields, well, that’s only one IP address per shield, right? I get a lot of people asking me how to send tweets from an Arduino through an Ethernet or WiFi shield. It turns out to be a bit tricky, because Twitter uses OAuth to manage authentication, which is difficult to program on an Arduino due to its limited program memory size. Most libraries that send tweets from an Arduino do so by handling the authentication through another site. There are a couple of libraries that attempt to do it directly from the Arduino, but I haven’t seen one I like yet that sticks to the Arduino API style and/or doesn’t take up a lot of memory (though I am ever hopeful someone will write one). Since not everyone knows how to write a server-side middleware program to handle the authentication, I decided to see if I could get an existing service to take care of it for me.